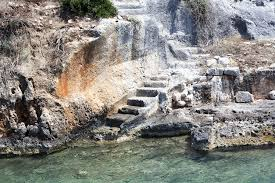 Any trip to Turkey to perhaps stay in one of the Villas in Kas such as https://kas4villarentals.com/ should be accompanied with a trip to see the beautiful sunken ruins of Kekova. The beautiful turquoise waters of the area conceal the incredible remains of a city that has been lost to the waters. Thousands of tourists visit this region each year to catch a glimpse of these underwater treasures. The wider area includes the villages of Kalekoy and Ucagiz and is home to some amazing cultural and natural sites. It is due to its location to the water and access to other natural features that the region was much fought over between the Italians and the Turks with the latter winning following the Convention in 1932 been Italy and Turkey. Kas is the perfect location to explore these ancient ruins as regular boat tours leave from here to take tourists on a route around the remains. This is the only way to access the site. Swimming amongst the ruins is forbidden although many petitions have been submitted to allow diving tours and parties to explore the sunken remains in a bid to further boost tourism in the area. The remains can be found on the northern side of Kekova and are in fact an ancient Lycian settlement known as Dolchiste, that was subjected to an earthquake around the 2nd Century. This earthquake was so strong that it resulted in large portions of the village being claimed by the sea. During the Byzantine era some of the Dolchiste village was rebuilt and it began a new life as a coastal village. However during this period of time there was a very real threat from Arabs in the area and this resulted in those people living in the area deserting the village once again. If you want to explore some of the crystal blue waters in this region you can swim in Tersane Bay and Akvaryum Bay. 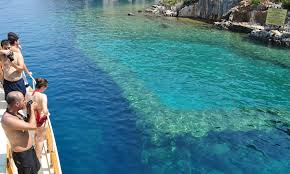 In Tersane Bay you can also see the remains of a Byzantine church and what better way to enjoy the beautiful architecture of a church of this era than whilst swimming in the waters that surround the island of Kekova. As well as the ancient Dolchiste there are also many other sites that you may want to take in including some wonderful forest areas and beautiful landscapes as well as some incredible cuisines to try whilst you soak in the coastal atmosphere.